Look back more than 100 years to the year 1900. Although the figures vary a bit by source, the populations of major cities that year may seem surprisingly large: London (6+ million), New York (4+ million), Paris (3+ million), Berlin (2+ million), and Chicago and Vienna (1+ million each). Unlike today, urban residents in 1900 were extremely anxious to see the number of gasoline-powered vehicles grow rapidly in their cities. But, why? We’ll explain the little-known relationship between horses, cars and car parking. Starting around 1890, there was a rapidly growing chorus of complaints about the common horse throughout cities and towns of all sizes around the world. A horse powered each taxi. Streetcars needed twelve or more horses each day. Carts, wagons, buggies and so forth also required horses. As many as 60,000, or more, horses would have inhabited a city of 6 million people such as London. The streets of London would be covered with roughly 20 million kg (22,500 US tons) of horse manure and 3.5 million liters (900,000 US gallons) of horse urine…each month! Besides the smell and mess, horse pollution created breeding grounds for typhoid fever and the “typhoid fly”. One 1908 article even reported, "maladies that fly in the dust, created mainly by horse manure", were responsible for the deaths of as many as 22,000 people each year in New York City. Life for horses working in urban areas was equally unpleasant. The average life span for a horse was less than 5 years with more than 15,000 dead horses requiring removal from New York city streets as early as 1880. It’s easy to see why the concept of any transportation means without a digestive tract was so appealing. By the start of the 20th century, the automobile industry was beginning a rapid and robust development especially in France, where 30,204 vehicles were produced in 1903… almost 50% of world automobile production that year. The Ford Motor Company started the same year. We know that nothing is ever as easy as it seems. 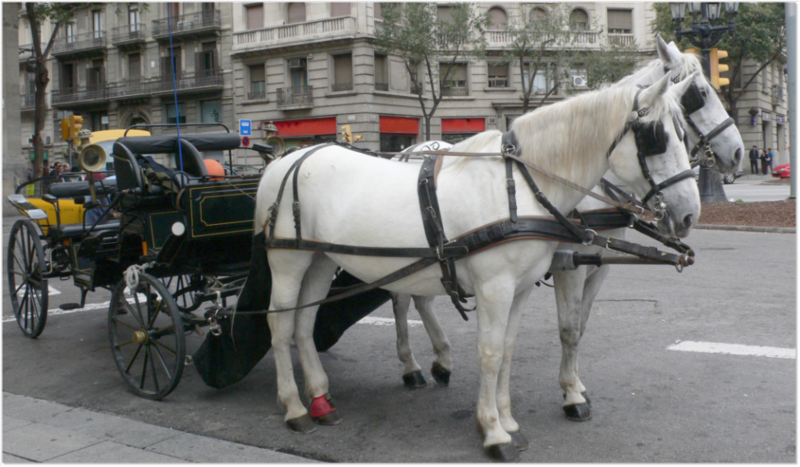 While cars were rapidly replacing horses, there came another problem…parking! Early cars weren’t very weather resistant with their open tops and leather interiors. Therefore, they needed indoor parking and horse stables were converted readily into the first car parking facilities. It didn’t take long for entrepreneurs to recognize the demand for urban car parking that minimized the amount of land required. An interesting factoid is that many of earliest parking garages utilized elevators to move cars to upper floors for parking…making them the precursor of the automated parking systems. The move from elevators to ramp-type parking garages didn’t begin in earnest until the 1920s. There doesn’t seem to be much of a movement to eliminate cars by populating urban areas with thousands of horses. However, there is a movement for more efficient and environmentally friendly parking using smaller automated parking systems. Ride your horse to see your local Skyline Parking representative to see how friendly and profitable APS can be.